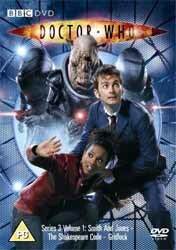 The third series of the reinvented Doctor Who sees the introduction of a new companion, Martha Jones, played by Freema Agyeman. Accordingly, the structure of this series' opening episodes mirrors that of Series 1, which introduced her predecessor, Rose Tyler. As with the 2005 episode Rose, Smith and Jones has no pre-titles teaser, and the story is conveyed from the perspective of the companion-to-be, as she encounters the Doctor (David Tennant), aliens and the TARDIS for the first time. The plot structure is a little flawed, though. Rose was introduced to the ship, its interior and its capabilities gradually over the course of an entire episode. Smith and Jones (by the same writer, Russell T Davies) has five minutes of "boarding the TARDIS" stuff tacked on rather clumsily at the end of the programme. Otherwise, though, this is a good, solid, exciting instalment, despite some slight disappointment that the aliens are not Sontarans. The Judoon's uniforms closely resemble those of the Sontarans, and for a moment, while viewing a trailer, I thought that was who they were. Like those recurring cloned foes, the Judoon help to keep the prosthetics budget down to a reasonable level by keeping their helmets on most of the time! And talking of monstrous similarities, what is it with Anne Reid and vampires? The last time she appeared in Who, it was in The Curse of Fenric, which featured the Haemovores. Now she's playing a bloodsucking Plasmavore. Not to be confused, of course, with the Plasmatons from Time-Flight. The Doctor makes a tantalising reference to a brother he once had. Justin Richards (who created Braxiatel and hinted that he might be the Doctor's brother) will be pleased. However, could the brother be another Time Lord we used to know...? Could there be a connection with the mysterious Mr Saxon, who is also mentioned in this episode...? Tennant is extra-eccentric here, clacking his teeth, making rhymes ("Judoon platoon upon the moon"), removing his tie in a mysterious manner, and jumping, sniffing and snorting as he purges his body of some absorbed radiation - though I was worried for a minute that he might be about to spit out a disgusting loogie! Gareth Roberts has been writing Who for years, mostly in the form of books, such as the brilliant Missing Adventures novel The English Way of Death, but also comic strips, the interactive Attack of the Graske and the Series 2 TARDISODES. It's about time he got to pen a television episode, and this is it. As you might expect, there's plenty of humour here. Numerous nods to the series' previous "celebrity historical", Tooth and Claw, include the Queen (Angela Pleasence) declaring the Doctor to be her sworn enemy and the Time Lord telling his companion, "No, no, don't do that", when she attempts to mimic Shakespearean language. There are countless instances of the Doctor providing inspiration for lines the Bard (Dean Lennox Kelly) will subsequently write, with Will declaring each time, "I'll have that!" However, my favourite bit of dialogue has to be when the Doctor needs to explain why he must save the Earth. As Martha points out, "The world didn't end in 1599. It just didn't. I'm living proof." The exasperated Time Lord replies, "Oh, how to explain the mechanics of the infinite temporal flux... I know: Back to the Future! It's like Back to the Future." "The film?" asks Martha, to which the Doctor responds, "No, the novelisation! Yes, the film!" Not only is this a hilarious cultural reference (to one of my favourite series of movies, by the way) but it's also an inventive narrative shortcut through the fact that a new companion should ask just such a question, even though the Doctor explained it to Rose and the audience just a couple of years earlier. The Time Lord has met Shakespeare several times before, as referenced in television serials such as City of Death and depicted in the Missing Adventures novel The Empire of Glass, the comic strip A Groatsworth of Wit (also written by Roberts) and the audio drama The Kingmaker. The writer takes care to neither confirm nor deny any of these stories, even those set at earlier points in history than this episode. Indeed, Dean Lennox Kelly's accent ties in rather well with the events of The Kingmaker. The fact that the Doctor is surprised when the Bard figures out he's a time traveller, despite the fact that they've met before, could simply indicate that the Time Lord hadn't thought Will would recognise him in his latest incarnation (as Johnny Fanboy explains here). Shakespearean nit-pickers may also point out that the lost play Love's Labour's Won was actually written before 1599 - before 1598, in fact, as its title is cited in Francis Meres's Palladis Tamia, Wits Treasury. However, I would theorise that Will began the play before 1598 but was stuck for an ending until the events of The Shakespeare Code. This marvellous episode is a labour of love that certainly wins my vote. Like Series 1, the opening three episodes of Series 3 feature one of each of the three temporal settings, past, present and future, as the Doctor shows his new companion what his TARDIS can do. As was the case two years earlier, these opening instalments also occur in immediate succession of one another. At the beginning of The Shakespeare Code, the Doctor and Martha continue a conversation from the end of Smith and Jones, and when the Time Lord exits the TARDIS at the start of Gridlock, he pulls out an arrow that had been fired into the ship's door at the end of the Shakespeare episode. In my review of New Earth, I guessed - entirely incorrectly - that both New Earth and the Face of Boe (voiced by Struan Rodger) would return at the end of Series 2. Instead, this episode marks the programme's third visit to the year Five Billion and thereafter, and features the third prominent appearance by the Face of Boe. It's nice to see that "big old face" (as the Doctor calls him) again. Before he departs, he imparts some words of wisdom, which the Doctor denies, but which nevertheless feed into both of the main plot arcs of this season: the Mr Saxon arc, and the Doctor getting over the loss of Rose and accepting Martha in her place. Perhaps The Shakespeare Code has brought Back to the Future to the forefront of my mind, but the dystopian depiction of New Earth reminds me of that trilogy of movies, especially the second one. The flying cars are the most obvious connection - though both the film and this episode were probably inspired by an earlier source, Blade Runner. The TARDIS's arrival in a rain-lashed back alley also brings to mind Marty and Doc Brown's landing in Back to the Future - Part II. Gridlock is my least favourite of the episodes on this DVD. It contains little that is truly innovative and makes scant use of Martha - until the end, that is, when she manages to coax some honesty out of the Doctor about the nature of his loneliness. Writer Russell T Davies throws in some lovely references to the past, including a description of Gallifrey that is very similar to the one given by Susan in the 1964 serial The Sensorites. There's a bigger blast from the past than that, but I wouldn't want to spoil it for you, just in case you don't already know...! All in all, this is a very respectable start to the new season.